Garage: Double, Attached "26 x 26 + 9.5 x 10 Mud"
Upscale living in this scenic property located 22 km northwest of Neilburg, Sk. 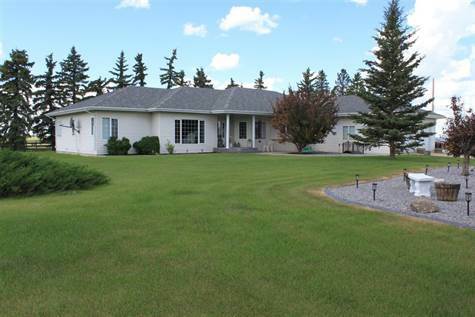 With over 4,200 sq ft of living space in the modern bungalow, a beautifully treed and landscaped property, and 4 quarters of farmland! The land is comprised of a productive Oxbow and Blaine Lake association clay loam to loam texture soil with mix of grainland and gently rolling pasture, crop insurance G and F.
- Built in 2004, this 2,616 sqft bungalow features a 5 bedroom 4 bath layout with a finished basement. - The main floor features a spacious kitchen including double wall oven, eating island with wooden baker’s counter, built-in china cabinet, walk-in pantry, and an abundance of storage! - Adjacent to the kitchen is the breakfast nook and family room with access to the wrap around 12ft x 28ft north facing covered deck and 12ft x 24ft west facing deck. The kitchen also leads to the formal dining room and living room. - The master bedroom has a large walk-in closet and 4 piece ensuite with jetted corner tub and shower. Down the hall is the 4 piece main bathroom, den, large bedroom, and main floor laundry. - Completing the main floor is a 2 piece bathroom and mudroom, leading to the 26ft x 26ft double car heated garage, with large storage room. - The basement features a large L shaped family room, 3 additional bedrooms, 4 piece bathroom, den, storage room with shelving, cold room, and the utility room. - Heat for the main floor is forced air natural gas furnace, while domestic hot water and in-floor heat for the basement and garage is supplied by the natural gas boiler. - Garage: 24ft x 28ft detached insulated garage/workshop with single overhead door, concrete floor, 2 steel workbenches with drawer storage. 100 amp service with welding plug. - 12ft x 24ft all season cabin with kitchen, bathroom, and loft bedroom. - Water supply is a 180ft well (seller states 11 gpm), septic is a lagoon located west of the house.